The victims were accused of being “communists,” an umbrella that included not only members of the legally registered Communist Party, but all likely opponents of Suharto’s new military regime — from union members and women’s rights activists to teachers and the ethnic Chinese. Unlike in Germany, Rwanda or Cambodia, there have been no trials, no truth-and-reconciliation commissions, no memorials to the victims. Instead, many perpetrators still hold power throughout the country. On Oct. 1, 1965, six army generals in Jakarta were killed by a group of disaffected junior officers. Maj. Gen. Suharto assumed command of the armed forces, blamed the killings on the leftists, and set in motion a killing machine. Millions of people associated with left-leaning organizations were targeted, and the nation dissolved into terror — people even stopped eating fish for fear that fish were eating corpses. Suharto usurped President Sukarno’s authority and established himself as de facto president by March 1966. From the very beginning, he enjoyed the full support of the United States. Military rule in Indonesia formally ended in 1998, but the army remains above the law. If a general orders an entire village massacred, he cannot be tried in civilian courts. The only way he could face justice is if the army itself convenes a military tribunal, or if Parliament establishes a special human rights court — something it has never done fairly and effectively. We need truth and accountability from the United States as well. U.S. involvement dates at least to an April 1962 meeting between American and British officials resulting in the decision to “liquidate” President Sukarno, the populist — but not communist — founding father of Indonesia. As a founder of the nonaligned movement, Sukarno favored socialist policies; Washington wanted to replace him with someone more deferential to Western strategic and commercial interests. But the extent of America’s role remains hidden behind a wall of secrecy: C.I.A. documents and U.S. defense attaché papers remain classified. Numerous Freedom of Information Act requests for these documents have been denied. Senator Tom Udall, Democrat of New Mexico, will soon reintroduce a resolution that, if passed, would acknowledge America’s role in the atrocities, call for declassification of all relevant documents, and urge the Indonesian government to acknowledge the massacres and establish a truth commission. 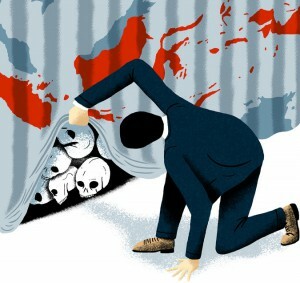 If the U.S. government recognizes the genocide publicly, acknowledges its role in the crimes, and releases all documents pertaining to the issue, it will encourage the Indonesian government to do the same. Otros artículos de Joshua Oppenheimer, de The New York Times	o del 30/09/2015.